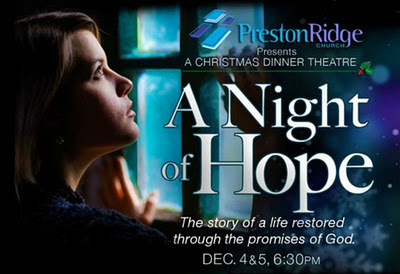 In just one week, A Night of Hope opens in Frisco. I've been involved with this show since mid September and directing the actors since October 30th. And I'm very proud of this show. There's much more to it than just the acting that I've been working on. It's also a full choir production with a human video and ... a Dinner Theatre! If you're local, I hope you'll join us. The show opens in one week. Sunday night is sold out. Grab your tickets for the remaining show at: PrestonRidge.org.